The most popular way to visit the Outback is by flying into either Ayers Rock (Uluru) Airport or Alice Springs Airport. We have also teamed up with Greyhound Australia to offer fantastic packages from Adelaide, Cairns and Darwin to Alice Springs. 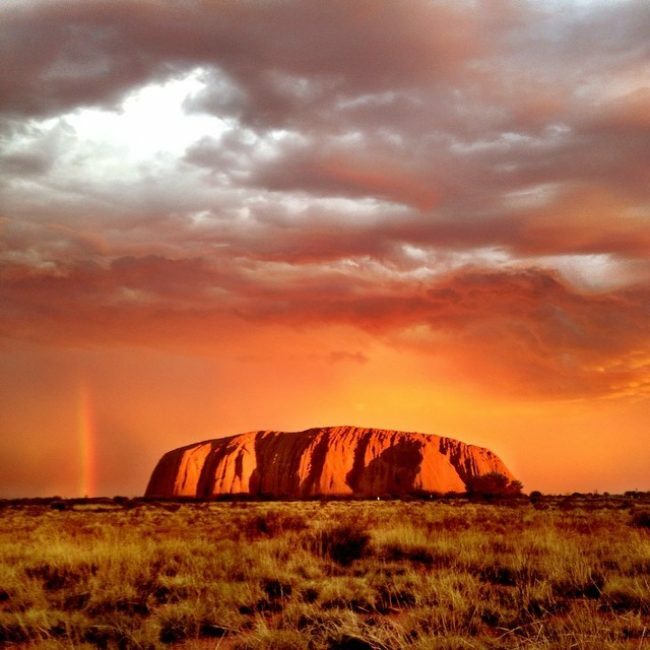 **Coming Soon - From APRIL 2019** - you can fly from DARWIN & ADELAIDE twice a week on Wednesday & Saturday into Ayers Rock (Uluru) Airport with Qantas. See our TOUR PAGE for 2, 3 and 4 day Rock Tour options - Beware booking Jetstar flights as you can be charged a lot for luggage, credit card fees etc. Book your own flight online using your credit card Jetstar is the cheapest airline that fly’s into Ayers Rock (Uluru) Airport from Sydney, Melbourne and Brisbane. The flights arrive into Ayers Rock (Uluru) Airport between 8.45am or 1:40pm. Please note: Flights arrival times will change throughout the year due to day light saving. We can pick up from all flights into Ayers Rock (Uluru) Airport between 11.30am and 14.00pm. You take our 3 DAY ULURU Tour from Ayers Rock where you will be visiting Uluru sunset, sunrise, Kata Tjuta and Kings Canyon. You start the tour from here at 12.30pm and finish in Alice Springs on day 3 at 5:00pm staying at YHA Alice Springs on Day 3. Packages quoted are “One Way Flights only” and you book your own flights online using your Credit Card www.jetstar.com Once you have booked your flight arriving into Ayers Rock, you book your 3 Day Uluru Tour online for 12:30pm PICKUP the same day you arrive. Simply add our tour price for the 3 Day Uluru Tour $370.00 to the Jetstar Flight & this becomes your Flight and Rock Package. *** Prices are One Way from 01/04/2018*** Prices Start From: Book early as prices vary and change daily. Book early for cheapest flights! Flying in & out of Alice Springs DAILY from ONLY $250.00!! Spending a little more and fly into Alice Springs for $250.00 either for the day before or after The Rock Tour is a much better itinerary and outback experience which allows you to choose the 3 Day Uluru options (Start & Finish in Alice Springs or Start in Alice Springs & Finish in Ayers Rock Uluru). Qantas Airfares are all inclusive and DO NOT HAVE SEVERAL ADD ONS like Jetstar. Book your own flight online using your credit card Qantas is the only airline that flys into Alice Springs from Adelaide, Brisbane, Cairns, Darwin, Melbourne, Perth and Sydney daily. A lot of our customers fly into Alice Springs on Day 1, go on tour Day 2, 3 and 4 and on the 4th day leave the tour at Ayers Rock (Uluru) Airport at 10am and catch a very cheap Jetstar Flight from Ayers Rock (Uluru) Airport to Sydney, Melbourne Or Brisbane for as low as $195. Alternatively you can fly from Melbourne and Sydney into AYERS ROCK (ULURU) AIRPORT (our Rock Pick UP itinerary) with both Jetstar and Virgin Australia. You can start the tour from here at 12.30pm and finish in Alice Springs on day 3 at 5pm. This REVERSE Itinerary means you are then searching for flights from Alice Springs to your next destination. Packages quoted are “One Way Flights only” and you book your own flights online using your Credit Card. Once you have booked your flight to Alice Springs, you book your 3 Day Uluru Tour online for 5.30am departure the next day out of Alice Springs. Simply add our tour price for the 3 Day Uluru Tour $370.00 to the Qantas Flight & this becomes your Flight and Rock Package. Prices Start From: Book early as prices vary and change daily. Book early for cheapest flights! Direct flights with Qantas are available on Saturday & Sunday only, otherwise the flight goes via Sydney and then into Alice Springs. Flying in & out of Alice Springs from ONLY $250.00!! Virgin Australia fly into Alice Springs from Adelaide and Darwin (5 times a week) and Brisbane (twice a week). Virgin Australia also fly’s into Ayers Rock (Uluru) Airport from Sydney DAILY. **New July 2018 - 7 day Whimit passes** These are excellent value and check out our PACKAGES section on the website for really good value for money! Depart from Adelaide at 6pm DAILY and arrive in Alice Springs the following day at 2.30pm. Depart from Darwin at 11.40am DAILY and arrive in Alice Springs the following day at 9.15am. Depart from Cairns at 1.00am on Wednesday and arrive into Alice Springs the following day at 9.15am. Depart Townsville at 1.00am on Wednesday and arrive into Alice Springs the following day at 9.15am. From 1st July 2016 the Ghan only offer the Gold Cabin service from Adelaide or Darwin once a week into Alice Springs. There are no longer backpacker seats available on the Ghan Train. For more information on the Gold Cabins please email us on info@therocktour.com.au for a quote. Explore Alice Springs and its nearby surroundings with a reliable car hire from VroomVroomVroom. They compare rental cars from major brands including Avis, Hertz, Thrifty and Budget. Booking with them assures you of getting the lowest price plus they don’t charge any booking and cancellation fees.